It took us 23 hours door to door, but we escaped winter. And now we’re sweating, but very joyful to be here at Limão Verde. 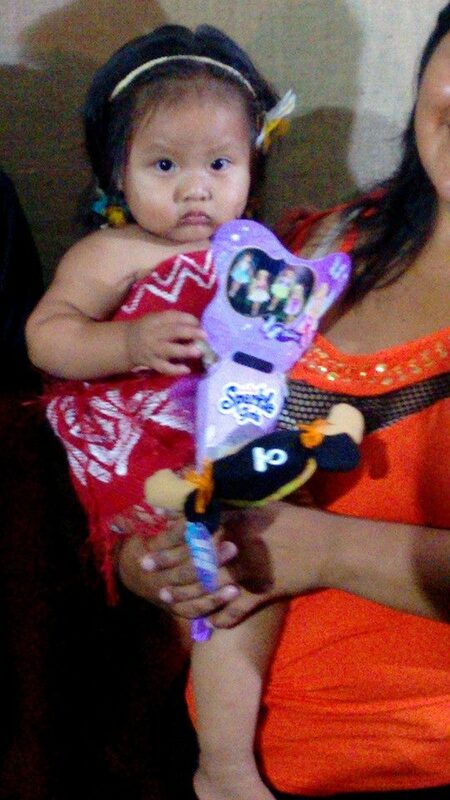 Praise God for safe travels as we took two flights and a very bumpy bus ride over a red dirt “road.” We were greeted with a birthday party for a one-year-old girl, the granddaughter of the pastor here. Worshipping out in the open air with members of the Terena Indian tribe was very moving. Dinner consisted of a birthday cake – all 2.5 by 4.5 feet of it! The boys bedded down in the church, and all the girls slept all together in a room. God’s natural alarm clock (roosters) started at about 4:50 am, but most of us were so tired it did not matter. We all love trying to connect with the people here and using the few Portuguese words we have learned. It makes the kids laugh when we try to speak to them! We learned today that about 2000 people live here on the reservation, and about 190 people attend the church we are supporting. Praying that our outreach will bring more people in! Our first full day was a Sunday. They had Sunday School in the morning and have their main service in the evening. We spent the morning getting ourselves organized for our first day of Kids Camp, which involved unpacking and going through and reorganizing all the suitcases of crafts and games and donations we brought. Lunch was an amazing feast (which, as the week went on, we realized was their main meal of the day) of rice and beans, spaghetti, yucca and salad. After lunch we had our first day of Kids Camp. Our theme was “The King & His Eternal Kingdom.” Many of the kids that came arrived early and we loved their anticipation and excitement. There were only about 110 kids that came the first day, which was surprising and somewhat disappointing to us all. On the other hand it doubled the number of children that are usually reached in the ministry on any given day and it gave us more time to really connect with each child. The weather was wonderful…warm and overcast. We were blown away with the Open Arms team we came to partner with that is from Brazil. Their love and excitement and energy for God and their mission here was infectious to all of us. The kids, both our own and the kids we were serving, played outside together until they went to bed. It was so amazing to watch them form relationships so quickly, even without speaking the same language. Pastor Jonas commented to our team leader that it looked like two parts of the same family coming together after a long time away and not at all like strangers. 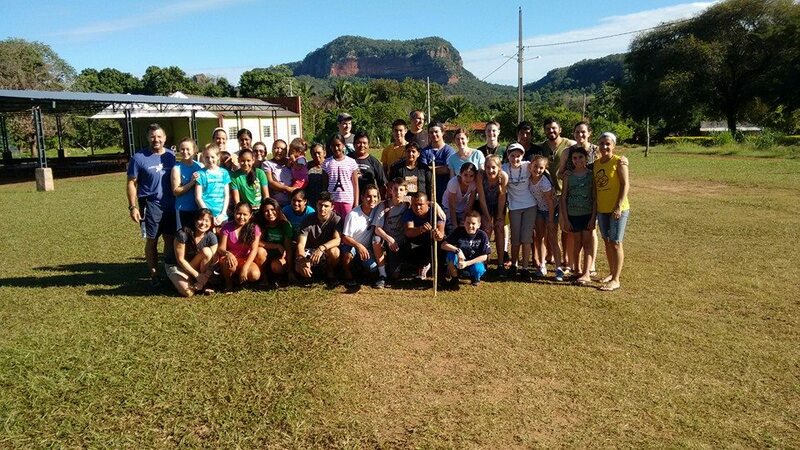 The following three days we held Kids Camp in 2 sessions because of the kid’s school schedule, so half came in the morning from about 8:30-10:30 am (time is a “general guideline” here in Brazil) and half came in the afternoon from 2:30-4:30 pm. It seemed that the guys in the group had a particularly powerful testimony in their playful and attentive interactions with the kids, and we are hopeful that the memories they created will plant seeds for the kids to understand the love of Christ. We were very surprised by how involved and fastidious the kids were during the craft time. During the t-shirt coloring on the first day and the foam photo frame sticker decorating on the second day, we noticed how carefully all of the kids were in making their crafts, no matter their gender or age. In between the two sessions, about 50 of the volunteers and kids hiked into the mountains and up to a waterfall pool where many of us climbed up and dove from the rocks into the 25’ deep pool. 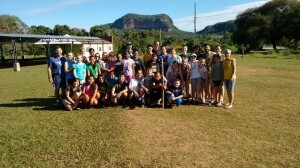 Our team (the “Americanos”) took quite few minutes readying ourselves for this adventure; wearing tennis shoes and sunscreen and bug spray and arming ourselves with backpacks full of water and snacks. As we headed out on our hike, some of the natives in the area (kids and adults) just came along wearing whatever they were wearing that day (there were NO tennis shoes on their feet). We’re sure they got a kick out of all our extensive preparations. We had burgers and hot dogs for dinner, a thoughtful gesture of familiar food. The women who cooked our meals had to be taught how to cook a hamburger. On this our third day of Kids Camp the message was that the King who came to establish His kingdom, Jesus, gave his life so that we could be princes and princesses in that kingdom. The teaching time and craft were really special this day as we made wordless bracelets and the gospel was given and given and given again. The children were able to use their bracelets then to explain the gospel back to our Brazilian team and it was really precious to see. In the afternoon we got to experience a Brazilian rainstorm. It poured! The sound of the rain hitting the tin roof over the open-air church was so loud that we had to split the kids into little teams of 4 and 5 with some volunteers in each to do the teaching as they put together their bracelets. Those bracelets didn’t leave their wrists the rest of the week. Praise God for the seeds being planted here. At night we were blessed to hear the testimony that had been given to the children during the day from one of the Open Arms volunteers, Bruno. His story of salvation from addiction, crime, and finally being beaten near to death was amazing and our kids were given an opportunity to see how Christ can dramatically change a person’s life. the children we had served all week presented a traditional dance in the native dress and the Open Arms volunteers in the tribe did traditional face painting on some of our girls and allowed them to dress up in their headdresses. We wrapped up the evening with a bonfire and Smores. We brought 600 marshmallows and roasted almost all of them! We counted one child who ate 8 Smores!! Tomorrow we head into town for a night at a hotel and then home. Our hearts are simultaneously full of joy and heavy at the same time. This is just a summary of our days with our friends in the Terena Tribe and the missionaries and volunteers from Open Arms Worldwide. Over the next days and weeks we hope to post more testimonies and pictures as our team has time to process all that the Lord has done in and through us this week. Visit us on Facebook at www.facebook.com/openarmsworldwide for more pictures or go to our Photo Slide Show by clicking HERE. We have been stretched in ways we couldn’t imagine before getting here and it takes some time to figure out how to put that into words. Thank you all for your prayers and for your support. 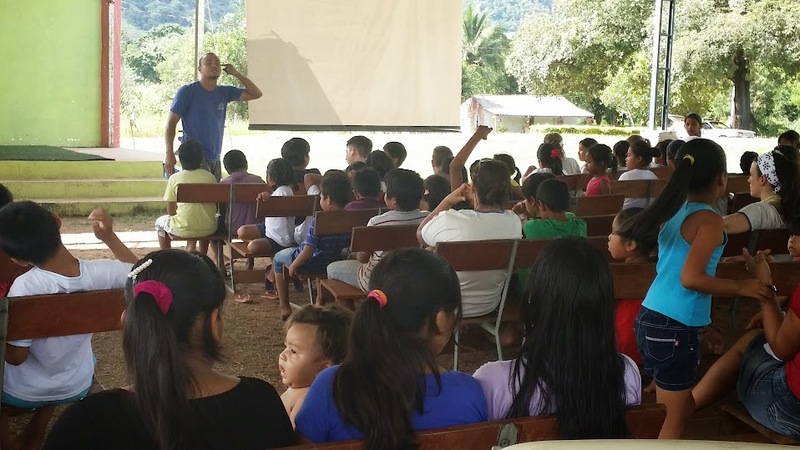 Please pray for Pastor Jonas and his congregation as they continue to proclaim the King of kings among their people, for Sarita, Eduardo, Claudia, Lucas, Bruno, and Jean from Open Arms as they continue their work of mobilizing the church to reach and teach children for Christ.